First: The rock. 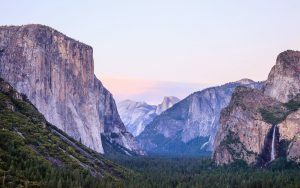 “El Capitan” is by far one of the most imposing and breathtaking monoliths in the world. It is 3200 feet of sheer granite. In the climbing community, it is revered as a mecca of sorts. Second: The speed. Alex sent El Capitan in just under four hours. It takes most climbers several days to make it to the top. Third: The climbing. Free soloing is a form of climbing where the athlete performs without the use of any equipment whatsoever – no ropes, no harness, no helmet, nothing. 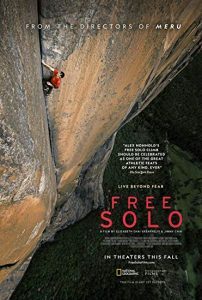 In the film, it’s noted that less than 1% of climbers consider themselves to be free soloists. It’s appeal lies in the true test of a climber’s technique, strength, speed, and skill. However, it is widely considered the most dangerous form of climbing because of the obvious and inherent risk of injury and death. Fellow climber and friend, Tommy Caldwell, makes it clear that, “Everybody who has made free soloing a big part of their life is dead now”. 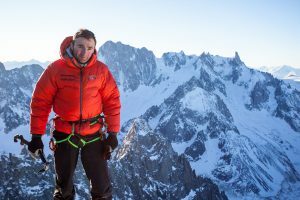 Some of the most notable losses to the climbing community were of experts like Ueli Steck or John Bachar. In this way, Alex’s feat, though wildly impressive, has also been considered highly controversial. His film crew recounts their moral and ethical struggles when deciding to document his climb, and the climbing community has been outspoken about their own concerns with supporting “risky” climbers in this way. It does pose the question, should these attempts be celebrated or cautioned? As an amateur climber, myself, I watched Alex’s climb with veneration and terror. It’s a fascinating feeling that tears you in two different directions. You want to be present to watch him make history but the likelihood of him falling out of the frame to his death is almost too much to bear. It brings to mind this idea of “controlled risk” which I think is an interesting concept. I firmly believe that you can mediate risk but, by nature, risk can’t be controlled. Alex had already fallen and bailed from that route in the year leading up to his ascent. There were countless factors outside of his control that could have changed the outcome for the worst that day. So, the next question becomes, is the risk worth it? Oftentimes, we make our assessments of risk based on our prediction of consequences and their severity. What Alex says about risk taking flips this model on its head, “People need to differentiate risk and consequence”. In an interview with EpicTV, he explains how the consequences of adventure climbing (falling) might be obvious, but the risk (or likelihood), is something much more personal and nuanced in the sport. So, many climbers will tell you yes, climbing is worth it. The consequences may be high, but it’s their job to make a dangerous situation “safe”. And so they take on risk. Even here, with our feet planted firmly on the ground, our lives are full of risk. Extreme sports may have a way of reminding us of our own fragility, but we have normalized so many things that are, in fact, risky. Let’s take driving for example. All things equal, I am statistically much more likely to die in a car accident than I am in a climbing accident. But, you can bet I’m still planning on getting in my car later. He trains seriously and strategically in order to be as physically fit and mentally prepared as possible – going so far as to log every specific move he will need to execute to be successful on each pitch. He self-reflects and consults with other professionals to make sure he is making this climb for the right reasons. Alex doesn’t want the influence or pressure of being on camera to push him to make life threatening decisions while climbing. He establishes clear safety precautions with his team that will minimize distractions for him while he is on the wall. The film crew and equipment are carefully placed and prepared to stay out of his way. He acknowledges his fear and is respectful of the limits of his comfort zone – when he bails on his first attempt he is embarrassed, but also knows that he just “wasn’t feeling it”. That recognition probably saved his life that day. Having our own unique relationship with risk keeps us, and the people around us, safe while also challenging us to grow and perform. 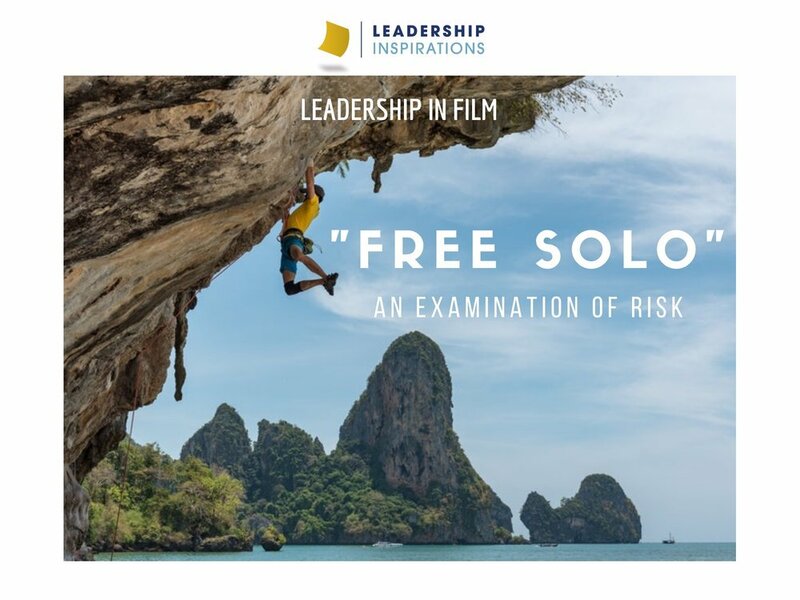 “Free Solo” does incredible justice to Alex’s mind-blowing accomplishment while also reminding us to reach for our dreams, to put in the tough work, and to push the boundaries of our comfort zones. 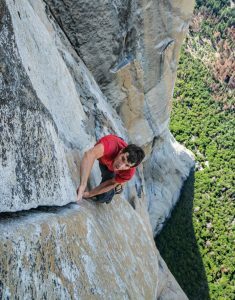 “Free Solo” is still playing in select theaters across the country and was just nominated for an Oscar, if you get the chance to see it I highly recommend it! We might not be faced with such extreme risks in our daily lives, but we can still set ourselves up for success by assessing and managing challenges with the right mindset. 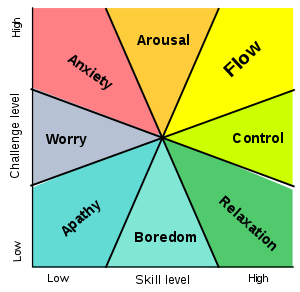 In 1975, psychologist Mihaly Csikszentmihalyi developed the concept of “flow” as a theory of expertise and happiness. When we are in a state of “flow”, we are engaging in a task that challenges us, but we also have the interest and skills to be absorbed and to make progress. It’s a kind of magical place that we know colloquially as “being in the zone.” Outside of this state of being we may experience worry, anxiety or boredom. What actively challenges you in life and work? Identify tasks, activities, responsibilities, etc that give you low, moderate, and high levels of challenge. What skills do you possess that help you to tackle those challenges? Would you say that you have high, moderate, or low levels of skill in those areas? Use the flow model to map each challenge and corresponding skill set. What zones do you fall in for each? For tasks that might cause you worry or anxiety…identify what pushes you into the “danger” or “panic” zone for those tasks. How can you manage those fears? For tasks that cause you apathy or boredom…identify what would help you feel more engaged or interested in those tasks. What’s missing and how might you satisfy those needs? For tasks that get you excited or that you have control over…identify what opportunities you have for growth in those areas. How can you continue to improve and who can help you? For tasks that get you in the “flow” zone…identify exactly what, how, and who helps you get to the state of mind. How can you replicate this feeling in other areas of your life?